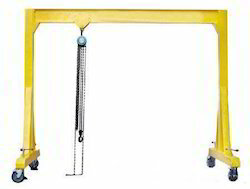 Offering you a complete choice of products which include manual gantry crane. Manual Gantry Crane serves as the most easiest and economic solution for carrying out your lifting and lowering problems. Space utilization issues are also looked over when choosing a Manual Gantry Crane.The basic difference is based on the capacity your Manual Gantry Crane can handle. Variations are based on several criterions a choosing the one which will closely suite the purpose is an important task.This is ideal for general purpose loading, transferring and handling jobs. These are usually suitable for both outdoor and indoor services. It is a basic requirement in most of the Motor Garages as well as Machine shops for loading and unloading of Engines and other materials from the Vehicles. Many producers are available in the market and looking out for the ones who can produce good quality of products is important.